I read this article and found it very interesting, thought it might be something for you. 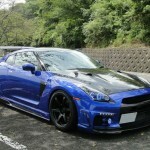 The article is called Wald Nissan GTR and is located at https://www.farmofminds.com/wald-nissan-gtr/. Nissan GTR with Wald body kit, Tommy Kaira side steps, Voltex Type5 carbon fiber wing, matt black 20″ Volk G2 wheels, Endless Zeal Function A coilovers and much more. You can also hear the beast with custom titanium exhaust at the bottom of the post. The car is elegant and very beautiful. I like blue color so much!